Abstract: Causal inference is a key component for comparative effectiveness research in observational studies. 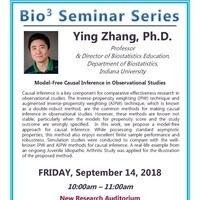 The inverse-propensity weighting (IPW) technique and augmented inverse-propensity weighting (AIPW) technique, which is known as a double-robust method, are the common methods for making causal inference in observational studies. However, these methods are known not stable, particularly when the models for propensity score and the study outcome are wrongly specified. In this work, we propose a model-free approach for causal inference. While possessing standard asymptotic properties, this method also enjoys excellent finite sample performance and robustness. Simulation studies were conducted to compare with the well-known IPW and AIPW methods for causal inference. A real-life example from an ongoing Juvenile Idiopathic Arthritis Study was applied for the illustration of the proposed method.